Applying a one-size-fits-all method of exegesis to the various genres of the Bible can lead to confusion and misunderstanding. Wisdom or apocalyptic literature must each be approached in its own unique way, and the same holds true for historical books or pastoral letters. Recognizing these special interpretation needs is central to the design behind the Handbooks for Old Testament Exegesis and Handbooks for New Testament Exegesis. 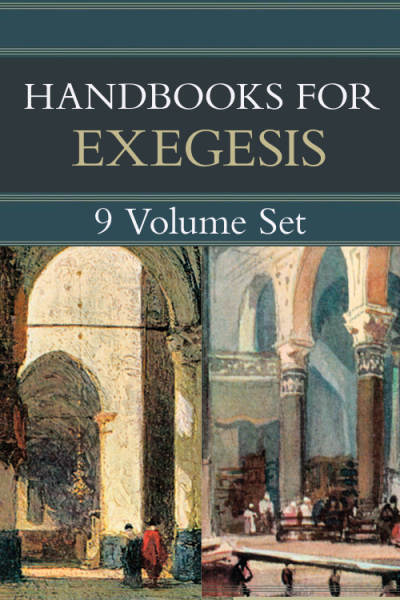 Valuable reference tools for students and pastors alike, the Handbooks for Old Testament Exegesis (HOTE) and Handbooks for New Testament Exegesis (HNTE) series provide readers with an enhanced understanding of different genres and strategies for interpretation. John D. Harvey (PhD, Wycliffe College, University of Toronto) is dean and professor of New Testament at Columbia International University Seminary & School of Ministry in Columbia, South Carolina. His other publications include Greek is Good Grief: Laying the Foundation for Exegesis and Exposition. David M. Howard Jr. (PhD, University of Michigan) is professor of Old Testament at Bethel Theological Seminary in St. Paul, Minnesota. His other publications include An Introduction to the Old Testament Historical Books.